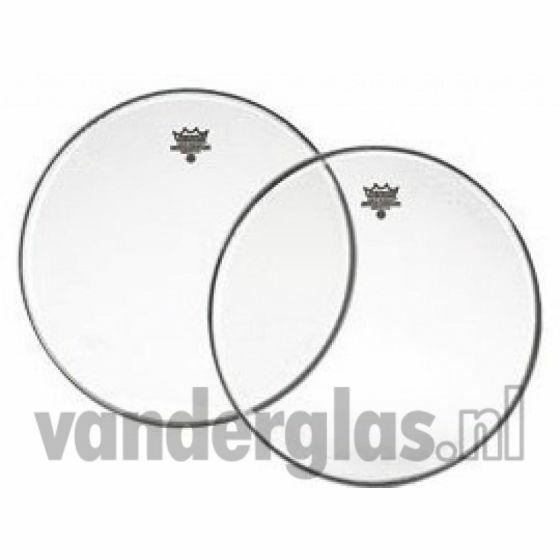 The clear drumhead is Remos brightest and most open sounding head. Theyre known for their bright tones, resonance, and sustain. Clear heads are best known as batter and resonant heads opening up the sound of tom-toms and bass drums. BE-0316-00 The clear drumhead is Remos brightest and most open sounding head. Theyre known for their bright tones, resonance, and sustain. Clear heads are best known as batter and resonant heads opening up the sound of tom-toms and bass drums. Clear Emperor® heads are made with two free-floating plies of 7-mil Mylar®, making them the brightest sounding multi-ply heads and most durable of the classic clear WeatherKing® series. Slagvel 16" Remo Emperor clear voor € 22,00 bij https://www.vanderglas.nl/.